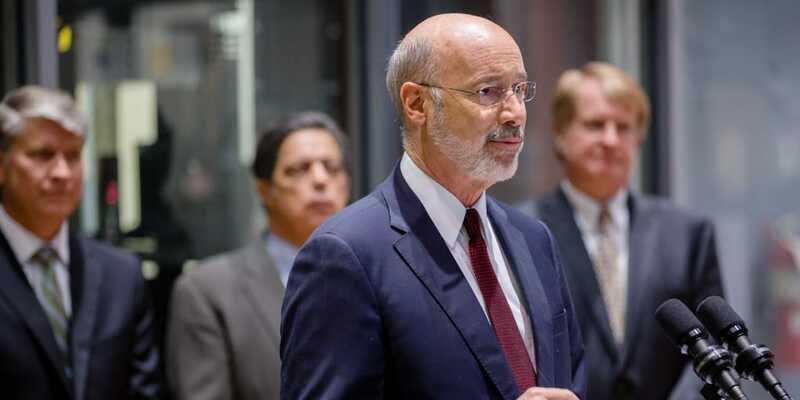 Harrisburg, PA – Building on his plan to expand job training for Pennsylvanians, Governor Tom Wolf today announced more than $5.3 million in the first PAsmart Apprenticeship and Next Generation Industry Partnerships grants for south central and southeast Pennsylvania. The governor launched PAsmart last year to increase STEM and computer science education, apprenticeship and job training to prepare workers with the skills that growing businesses need. The grants, totaling more than $1 million for the south central region and more than $4.3 million for southeast Pennsylvania, will support job training in building and construction, early childhood education, information technology, maintenance, and advanced manufacturing in those regions through both apprenticeship and Next Generation Industry Partnerships. Apprenticeships provide hands-on opportunities for workers to learn skills while earning a paycheck. Next Generation Industry Partnerships connect employers in the same industry to provide job training. PAsmart grants have been awarded this year through the Department of Education to bolster STEM and computer science in schools, and through the Department of Labor & Industry to strengthen skills training programs throughout the commonwealth. Separate PAsmart grants to increase apprenticeships and job training have been announced in the northwest, southwest, northeast, and north central regions of the commonwealth. The governor’s budget unveiled last week builds on the success of PAsmart to create opportunities for Pennsylvanians from birth to retirement. The governor’s Statewide Workforce, Education, and Accountability Program (SWEAP) expands early childhood development programs, increases investments in schools and educators, and partners with the private sector to build on the groundbreaking PAsmart initiative. The following are the PAsmart apprenticeship and Next Generation Industry Partnerships grants awarded in south central Pennsylvania. To view full details, visit PAsmart Regional Grants. Lancaster General Hospital – A $68,484.31 apprenticeship grant was awarded to create an apprenticeship program for building maintenance technicians, creating a pipeline of experienced maintenance staff to support the regional area’s aging workforce. The program will bridge the skill gap between new graduates and experienced maintenance personnel and provide on-the-job training focused on technical and soft skills. Mifflin County Academy of Science and Technology – A $70,000 apprenticeship grant was awarded to expand the Academy’s capacity for training welding apprentices in Mifflin and Juniata Counties by providing an increased number of training stations for employers to have more apprentices and incumbent workers trained. The Manufacturers’ Association – A $77,050 apprenticeship grant was awarded to establish a registered apprenticeship ecosystem in south central Pennsylvania through expansion of employer participation (especially small manufacturers) and increasing the number of journey workers and apprentices. Shippensburg University – A $60,000 apprenticeship grant was awarded to develop and convene a multi-employer consortium in the south central Pennsylvania region to promote the early childhood education apprenticeship program. ABC Keystone Chapter – A $67,182 pre-apprenticeship grant was awarded to support the ongoing programming of Berks Connections/Pretrial Services, an organization focused on improving employment participation of returning citizens through the development of a career pathway in the construction trades, as well as numerous evolving secondary and post-secondary partnerships and those that serve individuals with learning and emotional disabilities, including autism spectrum disorders. The Manufacturers’ Association – A $77,000 pre-apprenticeship grant was awarded to grow the current manufacturing pre-apprenticeship program to expand into Lancaster County schools, raise awareness of career opportunities in manufacturing and create an apprentice talent pipeline for south central manufacturing companies by participating in career fairs, providing training for advanced placement of pre-apprentices in registered apprenticeship programs and offering additional credentials for program participants. TranZed Apprenticeships – A $77,000 pre-apprenticeship grant was awarded for a tech support specialist pre-apprenticeship program designed to educate adults, youths and high school seniors to prepare them for specific entry level IT job roles within six months. Students learn both technical and business skills, earn multiple industry recognized certifications, a certificate of completion and up to eight college credits from the university for their future college education. JEVS Human Services – A $60,000 pre-apprenticeship grant was awarded to establish a TechServ Scholars AmeriCorps program for the region that will provide 15 pre-apprentices with nine college credits in IT/Security Operations training delivered by NuPaths@ Harrisburg University, IT industry-recognized certifications, and hands-on learning guided by professional mentors. NuPaths, LLC – A $77,000 pre-apprenticeship grant was awarded to provide a distance learning college alternative to prepare students throughout PA for well-paying IT jobs. Employer networks via NuPaths and TranZed will facilitate hiring of program graduates. Lancaster County Workforce Development Board – A $40,000 Next Generation Industry Partnership Convening grant was awarded to create an industry partnership in the Building and Construction industries. TranZed Apprenticeship Services – A $45,000 Next Generation Industry Partnership Convening grant was awarded to create an industry partnership in the business services industry. The Manufacturers’ Association – A $250,000 Next Generation Industry Partnership Implementation grant was awarded to implement business-driven priorities and action plans to support an advanced manufacturing industry partnership. The following are the PAsmart apprenticeship and Next Generation Industry Partnerships grants awarded in southeast Pennsylvania. To view full details, visit PAsmart Regional Grants. Aubrey Karoglan – An $149,780 apprenticeship grant was awarded to create a pipeline to entry-level employment through a healthcare industry apprenticeship as a certified medical assistant for students in Universal Audenried’s Health Related Technology Career and Technical Education program. Lehigh Career & Technical Institute – A $149,896 apprenticeship grant was awarded to increase the number of participants in the heavy equipment operator apprenticeship program in order to meet the workforce needs of Associated Builders and Contractors, Inc. member companies. Philadelphia Area Labor-Management Committee – A $150,000 apprenticeship grant was awarded to serve more than over 20 different multi-employer apprenticeship programs affiliated with the 31 building trades on the Philadelphia Building and Construction Trades Council. This proposal will also promote reforms of pre- and apprenticeship outreach and intake activities to increase the number of non-traditional apprenticeships, and to improve the completion rates of participants. Asbestos Workers Local Union No. 14 (DBA International Association of Heat and Frost Insulators and Allied Workers JAC (LU14) Training Center) – A $70,000 apprenticeship grant was awarded to re-evaluate, create, and implement an effective recruitment strategy for women to increase female applicants by 18 percent. Philadelphia Carpenters Joint Apprentice Committee (JAC) – A $50,346 apprenticeship grant was awarded to educate and train JAC apprentices in the following areas: occupational safety and health administration; process safety management in the petrochemical industry; mobile elevated work platform safety certification; and infectious containment risk assessment certification. IBEW Local Union 743 & Reading Division Penn-Del-Jersey Chapter NECA Apprentice Fund – A $50,346 apprenticeship grant was awarded to provide on-the-job training, classroom and lab instruction to apprentices to ensure they are proficient in installation, maintenance and troubleshooting of various electrical systems on commercial and industrial job sites. District 1199C Training & Upgrading Fund – A $150,000 apprenticeship grant was awarded to assist the Training Fund register, at least three new apprenticeship programs; transform at least two single-employer programs into group programs open to broader employer/apprentice enrollment; grow the number of health and human services employers sponsoring apprentices by at least 10; and enroll at least 50 new registered apprentices (RA) in new or existing programming. Arcadia University – A $150,000 apprenticeship grant was awarded to the Arcadia’s RA program for early childhood education address statewide capacity building priorities by serving multi-employer programs; promoting a competency-base, non-traditional model of apprenticeship; and promoting non-traditional service delivery that increases the number of RA’s serving working adults. First Up – A $68,262 apprenticeship grant was awarded to the program and its partners to provide career paths in early childhood education. The Wistar Institute – A $50,000 apprenticeship grant was awarded to promote instruction and hands-on job training for working adults, as well as traditional postsecondary education student populations, and promote similar competency-based, non-traditional models of biomedical research technician apprenticeship by providing guidance to other research institutions in the commonwealth. Philadelphia OIC – A $149,986 pre-apprenticeship grant was awarded, in partnership with Flex Right Solutions, Inc., Temple University’s Lenfest North Philadelphia Skills Initiative, and has the support of the Energy Coordinating Agency and Temple’s College of Engineering, to offer an innovative pre-apprenticeship that produces FAA certified drone technology employees. JEVS Human Services – A $150,000 pre-apprenticeship grant was awarded to increase access to STEM career paths for high-poverty youth, and helps build the regional workforce. TechServ, in partnership with JEVS Human Services, will provide 15 pre-apprentices (youth ages 18-24 who are disconnected from work and school) with 300 plus hours of structured training in technical skills, IT industry-recognized certifications, and hands-on learning guided by professional mentors. Community College of Philadelphia – A $150,000 pre-apprenticeship grant was awarded to expand our career readiness programs to anticipate future workforce needs, increase female and minority student participation, and to develop the pre-apprentice program experience relevant to the training and industry standards. Bucks County Community College – A $100,000 pre-apprenticeship grant was awarded to expand the college’s existing industrial maintenance (IM) pre-apprenticeship training program to high school students and other out-of-school-youth, age 18-24, in Bucks County. The program will span 24-weeks, 3 hours per day for a total of 288 hours of Industrial Maintenance instruction. Tech Impact – A $100,000 pre-apprenticeship grant was awarded to propose the ITWorks pre-apprenticeship program to establish a direct pipeline for underserved post-secondary students ages 18 to 26 to a registered IT apprenticeship program. After successfully completing ITWorks, graduates can apply their pre-apprentice hours to a Registered IT Apprenticeship, move directly to placement in IT, or get credit at most colleges for their CompTIA A+ certification attainment. The Alliance for Media Arts + Culture – A $77,000 pre-apprenticeship grant was awarded to provide a structured career path for youth and adults to advance entry into Arts2Work. The program, the first federally-registered National Apprenticeship Program in Media Arts + Creative Technologies, creates pipelines to jobs across diverse sectors including media, entertainment, journalism, advertising, and related fields. Lehigh Carbon Community College (LCCC) – A $77,000 pre-apprenticeship grant was awarded to Key Cultivate a regional talent pipeline for advanced manufacturing companies, primarily in Lehigh and Berks counties. LCCC and Reading Area Community College will partner to deliver certified production technician registered pre-apprenticeship programs that prepare participants for employment, lead to registered apprenticeship programs, and/or upskill newly hired incumbent workers for career pathway programs. Berks Connections/Pretrial Services – A $77,000 pre-apprenticeship grant was awarded to continue the Rebuilding Reentrants and Reading program when U.S. Department of Labor seed funding expires. The program offers an opportunity for individuals with a criminal history to acquire skills in the construction trades that lead to gainful employment and assists with the renovation of one of the City of Reading’s blighted neighborhoods. Community College of Philadelphia – A $60,000 pre-apprenticeship grant was awarded for an Industrial Maintenance Technician program. The program will provide participants with foundational knowledge in four areas: fluid power; industrial electricity; mechanical components; and programmable logic controllers. The Wistar Institute – A $60,000 pre-apprenticeship grant was awarded to expand the biomedical technician training program in a manner that will allow additional community college and underrepresented populations to experience the hands-on learning and include specialty training through the apprenticeship with potential employers in basic biomedical, biotechnical and biopharmaceutical research. District 1199C Training & Upgrading Fund – A $45,950 pre-apprenticeship grant was awarded for an ApprenticeshipPHL program, which plans to enroll 45 new behavioral health pre-apprentices between February 2019 and June 2020.
to expand the CVS Pharmacy Technician pre-apprenticeship/apprenticeship program. Grant funds will be used to focus on increasing career paths into registered pharmacy technician pre-app/apprenticeships in collaboration with cross-sector partners in Philadelphia, Bucks, Chester, and Montgomery counties, including CVS Health, community colleges, workforce boards, School District of Philadelphia, and Job Corps. DVIRC – A $40,000 pre-apprenticeship grant was awarded to create a consortium focused on the development of a pilot pre-apprenticeship program in the manufacturing sector. Philadelphia Area Labor-Management Committee – A $40,000 pre-apprenticeship grant was awarded to establish a pipeline to RA programs focused on serving individuals served by community-based organizations, establish connections to existing joint construction industry registered apprenticeship program in the region, and to deliver both hands-on and instructional-based learning. District 1199C Training & Upgrading Fund – A $300,000 Ambassador Network grant was awarded to establish a statewide system that supports early childhood education (ECE) apprenticeship. The Training Fund will launch five regional hubs that will customize, replicate, and grow ECE pre-/registered apprenticeship programs in their region and provide technical support to grow the program. Philadelphia Works (on behalf of ApprenticeshipPHL) – A $300,000 Ambassador Network grant was awarded to operate and oversee the proposed SEPA Region Registered Apprenticeship Ambassador Network, and bring together partners in the region to increase and align apprenticeship opportunities, develop apprenticeship pathways to careers, and connect employers, education, and the workforce. Greater Reading Chamber Alliance – A $44,662 Next Generation Industry Partnership Convening grant was awarded to engage 61 businesses and 31 public and community partners. Philadelphia Works – A $35,038 Next Generation Industry Partnership Convening grant was awarded to create an industry partnership in the hospitality, leisure & entertainment industry. Philadelphia Works – A $45,000 Next Generation Industry Partnership Convening grant was awarded to create an industry partnership in the advanced manufacturing industry. Delaware County Community College – A $45,000 Next Generation Industry Partnership grant was awarded to create an industry partnership in the logistics and transportation industry. Philadelphia Works – A $200,000 Next Generation Industry Partnership Implementation grant was awarded to implement business-driven priorities and action plans to support an advanced manufacturing industry partnership. Chester County Economic Development Council – A $250,000 Next Generation Industry Partnership Implementation grant was awarded to implement business-driven priorities and action plans to support an advanced manufacturing industry partnership. Chester County Economic Development Council – A $250,000 Next Generation Industry Partnership Implementation grant was awarded to implement business-driven priorities and action plans to support a business services industry partnership. Workforce Board Lehigh Valley – A $144,000 Next Generation Industry Partnership Implementation grant was awarded to implement business-driven priorities and action plans to support an advanced manufacturing industry partnership. Chester County Economic Development Council – A $250,000 Next Generation Industry Partnership grant was awarded to implement business-driven priorities and action plans to support a health care industry partnership. Chester County Economic Development Council – A $220,000 Next Generation Industry Partnership Implementation grant was awarded to implement business-driven priorities and action plans to support an energy industry partnership. To celebrate the PAsmart grants and investment in workforce development, L&I Deputy Secretary for Workforce Development Eileen Cipriani toured Lancaster General Hospital and the Reading Muhlenberg Career & Technology Center today and met with administrators and partners in the apprenticeship programs.